These kinds of requests just make us shake our heads. An R33 GT-R showing a 1990 240SX VIN. Selling at a dealer in NY for $40k. This would be the worst of the worst. 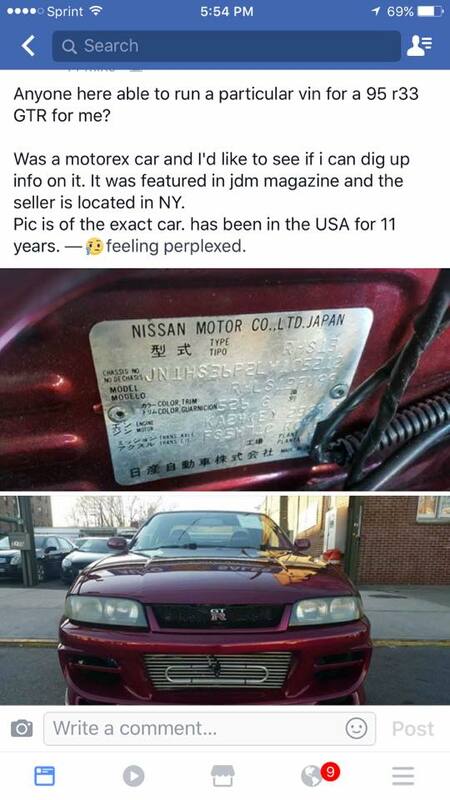 An R33 GT-R being sold out of New York, with a 240SX VIN plate on it. Obviously at some point it its life, this possibly stolen vehicle was illegally imported to the US, and a information plate from a US 240SX was put on it. If there is ever a car to avoid, it would be anything where there is VIN tampering. Why does this car display a 240SX VIN? Why are these guys selling it as a 1995 Nissan Skyline, when the VIN they are selling it under is 1990 Nissan 240SX. Avoid these kind of cars like the plauge. Nothing good can come from it. In just a few more years(2020), 25 year old, legal R33 GT-R will be available. We suggest waiting or finding a MotoRex car if you can't wait. There are signs of potential odometer rollback here, so verify the mileage with the seller. I know I would.